Taglines: Meet the first modern family. Excellent movie for the whole family to enjoy! I saw this movie at a sneak preview this afternoon. This was a very enjoyable movie for our whole family. Me and my husband sat there and laughed frequently, being completely enthralled with the story and graphics. Meanwhile, my daughter and my 7 year-old grandson sat with us, and they also were laughing throughout most of the movie. It has something for people of all ages to enjoy. It was heartwarming, and at times, it totally pulls on your heartstrings, too. The characters were appealing, and the type you find yourself rooting for as time goes by, and the animals that interact with the humans frequently stole the show! 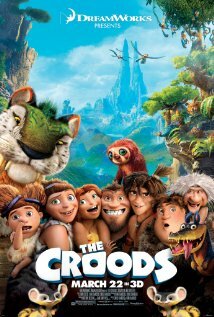 I know that some critics will have issues with some of the fantastic creatures that are seen, and they may take issue with the extraordinary things that The Croods are able to do physically. I knew going into this movie that this movie was a work of fiction, though, and therefore I was able to suspend my expectations of reality, and go on the ride that Dreamworks wanted to take me on. I thoroughly enjoyed myself, and took this movie for what it was - a lighthearted comedy about a family going through changes, and how they deal with those changes. I would definitely recommend this as a great movie to see! !